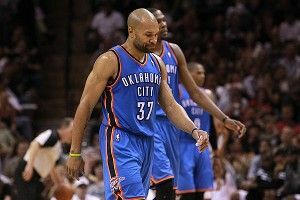 » Is Derek Fisher More Important Than We Think? Thanks to a brilliant second-half comeback and some questionable officiating, on Wednesday night the Oklahoma City Thunder beat the San Antonio Spurs in Game 6 of the Western Conference finals to advance to the NBA Finals for the first time since Clay Bennett pooped on the city of Seattle and moved the franchise to Oklahoma City. For many, the game was significant because it served as a changing of the guard in the Western Conference, seeing as how in consecutive rounds of this year’s playoffs, the Thunder and their young nucleus of Kevin Durant, Russell Westbrook, and James Harden (23, 23, and 22 years old, respectively) knocked out the three teams that have dominated the conference over the past 13 years. But for me, the most intriguing story line is that 37-year-old Derek Fisher, who is set to make his eighth career NBA Finals appearance in an attempt to win his sixth championship, is either more important than he’s ever been given credit for or is truly one lucky sumbitch. As of today, only 13 players in NBA history have won more championships than Fisher. Fisher, who was drafted along with Kobe Bryant in the 1996 draft, has worn a Lakers uniform for 13 of his 16 seasons in the league. In the final five seasons of his initial stint in Los Angeles, the Lakers won three titles and made it to the NBA Finals four times, including Fisher’s last season before signing with Golden State as a free agent. The three seasons in which he never played for Los Angeles were the three worst seasons for the Lakers in Bryant’s career. Fisher spent one of those years (2006-07) playing in Utah, where he helped the Jazz advance to the Western Conference finals for the only time since the Stockton and Malone era, after they failed to make the playoffs the year before. The following year, Fisher rejoined the Lakers, who lost to the Suns in the first round of the playoffs. Then Los Angeles went to each of the next three NBA Finals. This season, Fisher was traded to the Rockets before Houston bought out his contract and he signed with the Thunder with 20 games left in the regular season. The franchise is now in the NBA Finals for the first time in 16 years. Chances are, you had one of two thoughts while reading that last section: (1) Wow, I didn’t realize how important Derek Fisher apparently is to the teams he plays for, or (2) All of that is a coincidence and Fisher is nothing more than an average point guard who has been lucky enough to play on great teams. As is typically the case with these things, the truth is probably somewhere in the middle. It’s difficult to give Fisher, who has averaged 8.6 points per game over the course of his career, too much credit since what he’s done isn’t exactly unprecedented, what with there being eight other guys joining him in the Coattails Hall of Fame (guys with four or more titles who aren’t in the real Hall of Fame and averaged fewer than 10 points per game in their careers) — Jim Loscutoff, Robert Horry, Michael Cooper, Steve Kerr, Frank Saul, Kurt Rambis, Will Perdue, and John Salley. And it can’t be ignored that much of his perceived impact is in fact purely coincidental. Sure, the Lakers weren’t all that great without him, but they also lost Shaquille O’Neal at the same time as Fisher, and Bryant spent those three Fisher-less years playing alongside the likes of Kwame Brown, Smush Parker, and Luke Walton before the Lakers traded for Pau Gasol right as Fisher returned to Los Angeles. Meanwhile, his success with the Jazz can largely be attributed to Deron Williams and Carlos Boozer — who hit their strides that year — and it should be noted that many thought the Thunder would advance to the Finals long before Fisher ever joined the team. In other words — let’s not forget that correlation doesn’t imply causation. At some point, though, all of these coincidences have to add up to something, and as far as I can tell, that something is leadership. I could be wrong, since I’m not old enough to remember Luscutoff, Cooper, Rambis, and Saul winning their titles, but I’m willing to bet that Fisher stands out from the rest of the guys in the Coattails Hall of Fame because he’s the only one who has consistently taken control of team huddles throughout his career. That might not seem like much until you remember that for most of his career, Fisher played alongside Bryant, and “taking control of a huddle when Kobe Bryant is a teammate” seems like it’s right up there with “gambling with Gilbert Arenas” and “buying Boris Diaw dinner” on the list of the most ill-advised decisions an NBA player can make. Yet somehow, Bryant is probably the biggest Fisher fan on the planet and has nothing but great things to say about the guy. I’m not sure what Fisher says or does that makes him such a great leader, but I do know that it takes a special type of person to command the respect and attention of an entire team, despite putting up pedestrian numbers. Not that Fisher’s only contributions come in the form of leadership, of course. He’s hit enough big shots in his career to warrant both a YouTube compilation and the title of “modern-day Robert Horry” from Reggie Miller during Wednesday night’s broadcast. (In case you were wondering, Horry retired in 2008 and is only four years older than Fisher, so this is basically the equivalent of Miller saying that Durant is the modern-day LeBron James.) Even now, when he’s supposedly washed up, he’s still stepping up in big moments, as evidenced by the fact that nobody on the Thunder scored more points in the final five minutes of Wednesday night’s game than him. And it won’t get talked about nearly as much as it should, but he played phenomenal defense on Tony Parker for most of the second half and was a big reason why Parker went cold after scoring 21 in the first half. This of course doesn’t mean Fisher will ever make the Hall of Fame, or even be considered for that matter. But he should still be applauded for his remarkably unique career, and for being the consummate example of how important intangibles and players accepting their roles are to a team’s success. Hell, if nothing else, he should be applauded for being the only longtime teammate of Kobe Bryant who Bryant never wanted to murder.